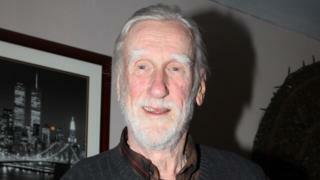 Donald Moffat, known for such films as Clear and Present Danger, The Thing and The Right Stuff, has died aged 87. Moffat was born in Plymouth, Devon, but made his name on the stage and screen after moving to the US in 1956. Two of his most famous roles were as US presidents - the real-life Lyndon B Johnson in 1983's The Right Stuff, and the fictional President Bennett in 1994's Clear and Present Danger. He also received two Tony nominations on Broadway, both in 1967. His daughter Lynn Moffat told The New York Times he died on Thursday as a result of complications after a recent stroke. Other family members paid tribute on social media. Moffat, who studied at the Royal Academy of Dramatic Arts (Rada) in London, started his acting career in the early 1950s with the Old Vic theatre company before moving across the Atlantic. He went on to appear in dozens of films, TV shows and plays. Moffat gave a memorable performance as the father of press secretary CJ Cregg, played by Allison Janney, in a 2003 episode of political drama The West Wing. One of his last stage roles was as 19th Century president Ulysses S Grant in a 2002 off-Broadway production of John Guare's play A Few Stout Individuals. US comedian Patton Oswalt remembered him on Twitter as "one of those always-great character actors who always delivered something special."